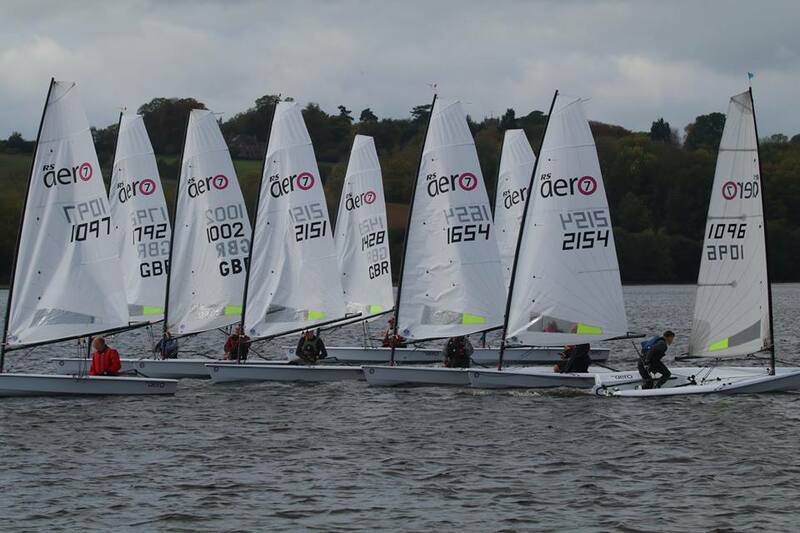 This was one for the young talent of the RS Aero Class with top 'Junior' (U16) sailor Tim Hire blitzing the RS Aero 7s with three 1sts and 'Apprentice Youth' (U22) Greg Bartlett winning the RS Aero 9s. 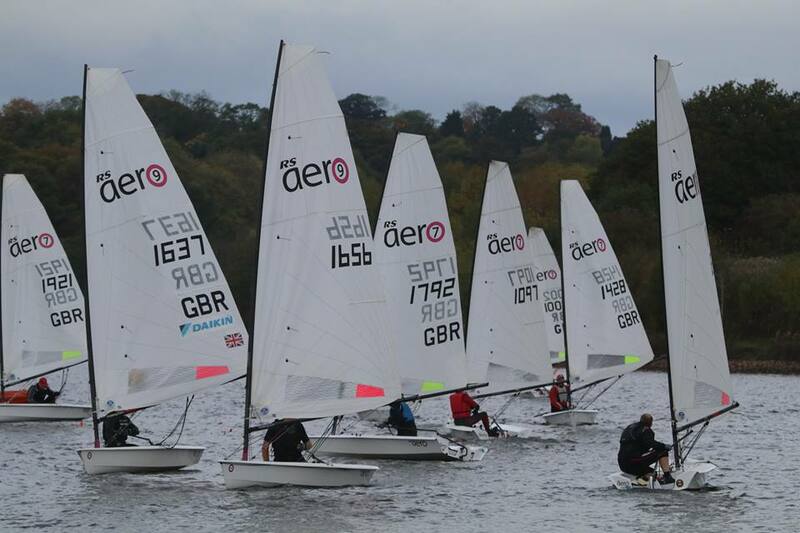 On Saturday 14th October, 2017, Chelmarsh Sailing Club held their RS Aero Class Open Competition on their picturesque, 110 acre reservoir near Bridgnorth, Shropshire. Race Officer Tony Hanan with wife Tracy as Assistant, briefed the 18 entrants that 3 races were planned, one before and two ‘back to back’ following lunch. The two rig sizes, RS Aero 7 of which there were 13 entrants and RS Aero 9 of which there were 5 entrants would have separate races with a staggered start. The 9 rigs started first, but both would sail the same course and for the same number of laps. 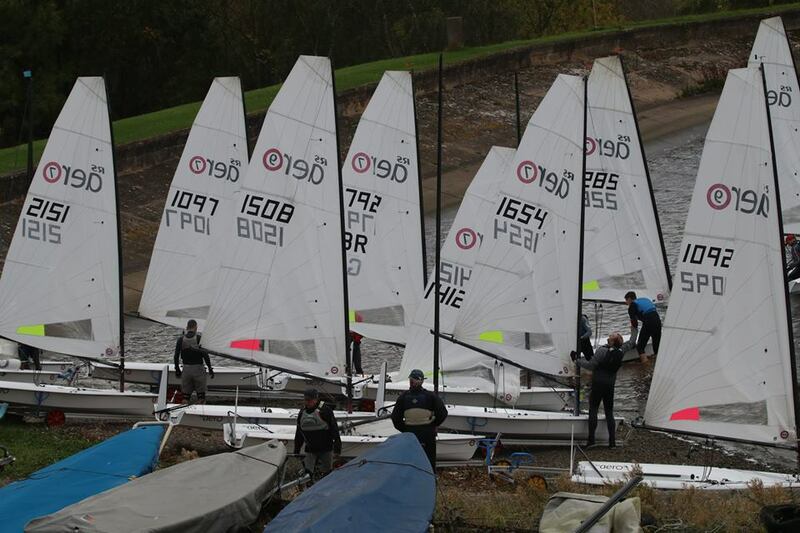 Nine entrants were Chelmarsh home boats and the nine visitors had travelled from as far north as Cheshire and from southern coastal Clubs to compete. Race 1 started as scheduled and in 8 to 10 knots of wind gusting frequently to 12 to 18 knots, from the south. In the 9 rig race and at the first mark, Greg Bartlett (Starcross YC) enjoyed a 50 yard lead over Robert England (Chelmarsh SC) who was 20 yards ahead of David Partridge (Chelmarsh SC). A fortunate gust whilst off-wind propelled Bartlett 200 yards clear also allowing Partridge to gain second. The fleet became grouped into a leading two and the remainder of the fleet until the finish. Bartlett first, Partridge second and England 3rd. The 7 rig fleet started 3 minutes later. At the first mark. David Cherrill (Broadwater SC) had a lead of 50 yards over Andy Hill (Hayling Island SC) with Tim Hire (Royal Lymington SC) very close astern. 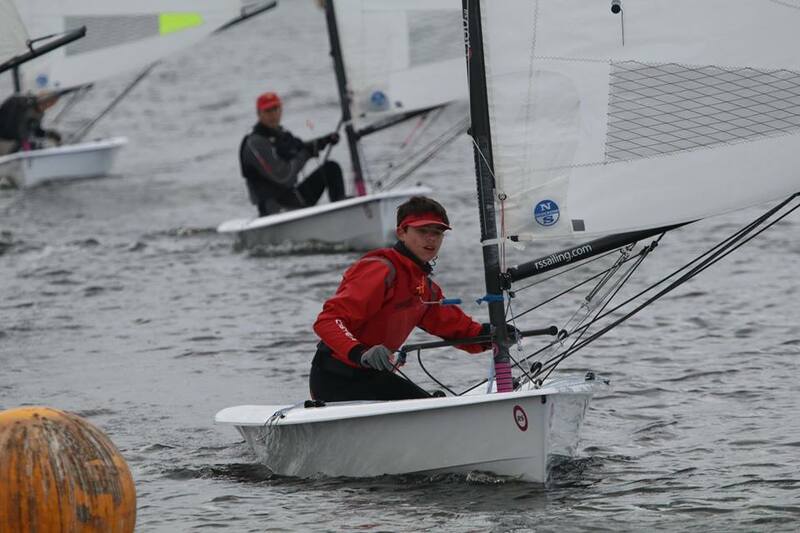 Race 2 started in increasing wind and more powerful gusts. In the 9 rig fleet and at the first mark, Bartlett, Partridge and England held the top placings respectively. Sadly for Bartlett, equipment failure forced his retirement. By lap three Nick Eales (Lymington Town SC) battled for second place in a neck and neck duel with England but with Partridge still leading some 100 yards ahead of the remaining fleet. At one stage, England gained the lead but at the finish it was Partridge, England and Eales in the leading 3 positions respectively. The 7 rig fleet race 2 saw Hire, Cherrill and Townend in the lead at the first mark but later the fleet split into three separate groupings each around 100 yards apart. A lap later, Cherrill had taken the lead with Hill in second place and Townend retaining third. The finish, however, saw early leader Hire first across the line, followed by Cherrill and Townend. Hill held fourth place. Race 3, back to back, got off promptly with a clean start in an ever-increasing wind strength. The 9 rig fleet saw Bartlett, who had retired in the previous race, using borrowed Chelmarsh Member’s, hull take the lead at the first mark. Partridge and England followed him respectively. These three competitors struck out a leading group some 200 yards clear. While the leading positions held changed several times for very short periods, the first mark positions of Bartlett, Partridge and England were doggedly maintained through to the finish in that order. The 7 rig fleet saw Hire take the lead with Cherrill second and Townend third at the first mark. Those positions were maintained for 2 complete laps of the course before Hill squeezed himself into third place before finishing. So, a Hire, Cherrill and Hill finishing sequence with Townend in fourth. The first three places of both Fleets were presented with a Dartington Crystal whisky class which was engraved with their position and the event. Maybe ‘old fashioned’ but the first Lady was Liz Potter of West Kirby SC who achieved 7th place with 12 points and received Prossecco and Malteesers for acres sail R & R accordingly. Winners speeches extolled the virtues of the Race Committee and particularly the galley of sausages, baked spud and beans presented by Ray Andrews and Linda Thursfield. Next up for the RS Aero UK Class is Chew Valley for the RS Aero and Singlehanded Open this Saturday 21st followed on 28/29th October by the RS Aero UK Inland Championships at Northampton. Full details on the UK Event Pages.